American Storm Water is a full service storm water management company that provides leading-edge technology and environmentally sound solutions to help protect our waterways and aquatic environments. American Storm Water understands the challenges our clients face when having to stay one step ahead of today's strict environmental regulations to control storm water pollution from entering their storm drains. That's why we are dedicated to creating partnership relationships with our customers, while creating catch basin screen technology that keep pollutants such as hydrocarbons, organic waste, sediments, trash and debris efficiently controlled and prevented from contaminating our precious coastal waters. Perhaps one of the most compelling reasons American Storm Water stands out above the competition is our ability to provide our customers with one of the most diversified inventories of equipment in the environmental services industry. 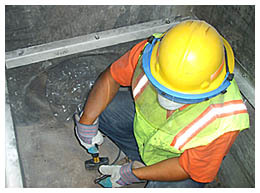 This enables us to handle storm water projects of any size with qualified and professional personnel who are standing by, ready to provide our clients with the most comprehensive storm drain solutions. American Storm Water is truly committed to providing our customers with the most innovative storm water products so we can all live in a cleaner tomorrow. Contact us to get more information about how we can help.